Make your themed wedding complete with our Fairytale Castle cake server set. 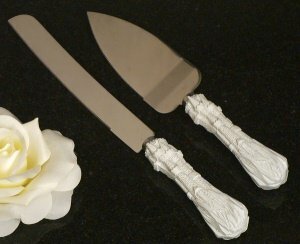 The cake knife is 12 1/2" long, the cake server is 10 1/2" long, and each piece has a silver metal blade with a white polyresin handle. Matching reception pieces are available for this set, or purchase all the pieces together in our Fairytale Castle Bridal Set.